CHICAGO – When Barack Obama took to the podium at Grant Park and gave his acceptance speech on the evening of November 4, 2008, his face appeared strangely reserved. His eyes did not reflect the overwhelming excitement of his supporters. Their grassroots efforts led to the election of a candidate whose popularity transcended national boundaries, injecting cynics with hope. Obama could make a believer out of anyone except, perhaps, himself. With all eyes averted eagerly toward him, the newly elected President of the United States looked cool, composed and utterly daunted. Was he simply attempting to maintain a grounded calm, a la Lovie Smith? Or was he beginning to fear that his campaign had somehow oversold his abilities to clean up a mess sure to linger throughout several presidencies? Now that he had the whole world in his hands, was he afraid that he would fumble the ball? These are the sort of thoughts you may find yourself grappling with while watching Jeff Deutchman’s intriguing and occasionally chilling documentary, “11/4/08.” It’s not a standalone film so much as an introduction to a sociological experiment. Deutchman recruited various friends to capture images of the historic 2008 Election Day from a variety of locations, which the film jumps between as the day progresses. The locations aren’t just of the familiar American variety: Chicago, Manhattan, Austin, Los Angeles, New Orleans, etc. We’re also treated to images from Paris, Berlin and Dubai. It’s startling to hear crowds of people overseas chanting, “Yes We Can!” The percussive sound of their voices mirror the rhythms of a Manhattan subway performer, whose drum beats accentuate the pulse of the streets, which is abuzz with Obama fever. Unlike HBO’s somewhat stagnant documentary, “By the People: The Election of Barack Obama,” Deutchman’s film is actually for, about and made by the very people who brought this unlikely candidate to the White House. 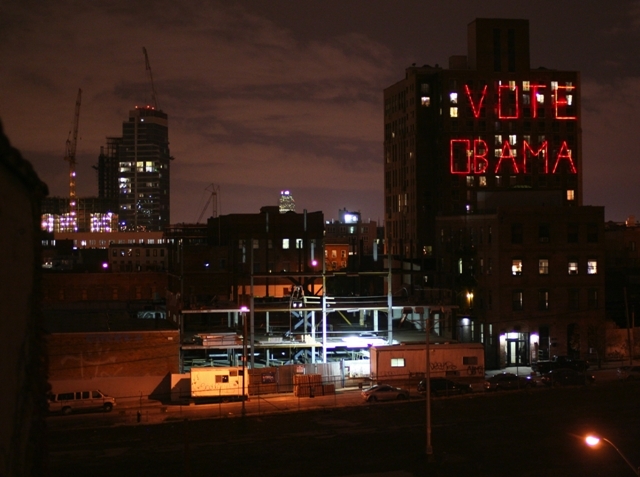 A neon sign proclaiming Obama support glows over Brooklyn in a scene from Jeff Deutchman’s 11/4/08. There’s nothing particularly cinematic about the fragments of footage assembled here, but their juxtaposition packs a genuine, cumulative power. Though several notable and gifted independent filmmakers contributed to this project, some of the most heartrending footage comes courtesy of aspiring school teacher Becky Hurwitz. At the Obama campaign headquarters in St. Louis, Missouri, Hurwitz captured some memorable vignettes of the impassioned workers. One young woman gushes about her experience of motivating an elderly voter to make it to the polls. Her excitement and energy is quite emblematic of the spirit that pervaded the entire Obama movement. This monologue is soon followed by what’s easily the film’s emotional high point. A sixty-year-old black woman, overcome with emotion, recalls her early memory of the Emmett Till murder, before conveying her gratitude for living to see the historic election of the first black president. “If you only knew what it meant to people who look like me,” she says tearfully. 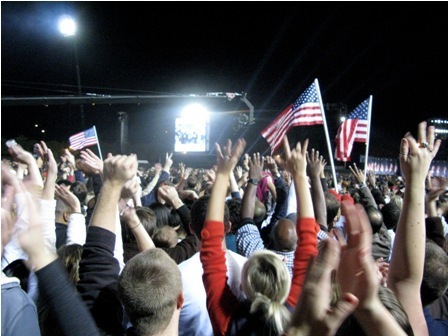 The crowd erupts at Grant Park on Election Night in a scene from Jeff Deutchman’s 11/4/08. Some segments in the film are less successful. Henry Joost (“Catfish”) has the promising notion of confronting Starbucks about its arguably illegal use of free coffee to encourage voter participation, but the filmmaker’s plans are swiftly derailed by a camera-shy employee. Other sections of the picture are woefully underutilized, such as the trip to Indiana taken by Joe Swanberg, the great micro budget filmmaker based in Chicago, and his wife and collaborator Kris. They go door to door handing out voting pamphlets, and encounter a woman who is utterly convinced that the Black Panthers will kill her should she turn up to vote (I wouldn’t mind seeing an entire film dedicated to this story thread). And for the record, Steve Backer is the only filmmaker who tries to engage his interviewees in a political discussion, asking a woman in Dubai about her opinions concerning Obama’s plan to immediately withdraw troops. “11/4/08” is both enhanced and hindered by its inherently experimental nature. At a running time barely exceeding the seventy-minute mark, the picture hardly qualifies as a feature-length film, and is best viewed online (where it is certainly most accessible). Upon finishing the movie, Deutchman hopes that viewers will check out its official website, where users will be able to upload their own footage from the day, download any available footage, and edit together their own version of the picture. Deutchman says that his ultimate goal is to create an “interactive history textbook.” And since much of the hype and momentum of the Obama campaign was generated online, what better place to log its history than the Internet? This is perhaps the best artistic way to explore a subject that is still in the process of evolving. It’s both exciting and heartbreaking to witness the sheer level of hope captured in this footage that has all but evaporated a mere two years later. Rarely has a document of recent history felt so achingly nostalgic. ‘11/4/08’ was released Oct. 22 on demand via iTunes, AmazonVOD, Sony Playstation and CinemaNow. It was edited and curated by Jeff Deutchman. It is not rated.